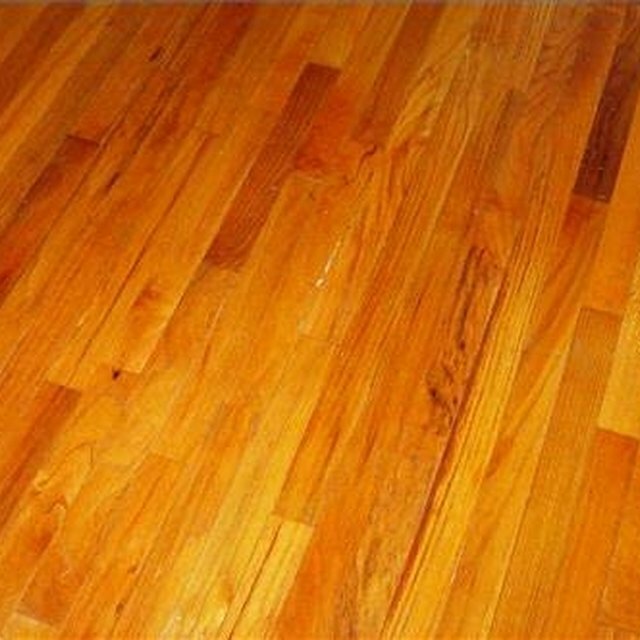 Solid hardwood floors can be refinished several times before they need replacing. However, V groove floors can only be refinished once or twice before the groove is sanded off. For this reason, use a less aggressive floor sander when refinishing "V" groove flooring. A do-it-yourself handyman can handle this project without much trouble. Remove the furnishings from the room with the V groove floor. Cut the paint and caulk at the joint between the baseboards and the wall. This will allow you to remove the baseboards without damaging the wall. A utility knife works well for this. Pry the baseboards from the wall carefully, using a carpenter's pry bar and a hammer. Save the baseboards so that you can reinstall them after refinishing the floor. Inspect the floor for visible nails or screws. Countersink them with a nail set and a hammer or use a screw gun as needed. Sand the entire floor with 100-grit sandpaper, using a floor pad sander. Work in the same direction the floor is running. Do not use a drum sander; it will remove material too fast for V groove hardwood flooring. Sweep the floor with a broom and keep all the sawdust. Inspect the floor for visible nails. Set them a minimum of 1/8 inch below the wood surface, using a nail set and hammer. Fill any holes with a mixture of sawdust and lacquer sealer. This will make a wood filler that exactly matches the floor. Let this dry. Use a putty knife to apply and mix the wood filler. Repeat step 6, using 120-grit sandpaper, and then do it again with 180-grit sandpaper. Sweep the floors before applying the stain. Use a lacquer-based stain on the floors. Work in sections so you can come back and wipe off any excess. Refer to the label for any specific instructions and precautions for the stain you are using. Let the floor dry per specifications. Wipe a coat of polyurethane on the floor using a lamb's wool applicator. Apply the finish, working in the same direction the floor is running. Follow the detailed instructions on the label. Repeat the application of the finish per the label's directions to build up a strong, protective finish. Nail the baseboard back in place. Use a lacquer-based stain and finish. Lacquer will dry faster than an oil-based finish. Wear a dust mask when sanding. Hardwoodflooringtalk.com: How Do I Level My Subfloor? Jim Wildman served in the United States Marine Corps as a Communication Chief for 10 years. After his tour of duty in Desert Storm he attended Oklahoma State University receiving his Bachelor of Architecture. He worked as an architect for 10 years before starting his own design/build company. He began writing in 2009 for Demand Studios and published on eHow. Do I Need to Stain Wood Before Applying Polyurethane?